Hi everyone. 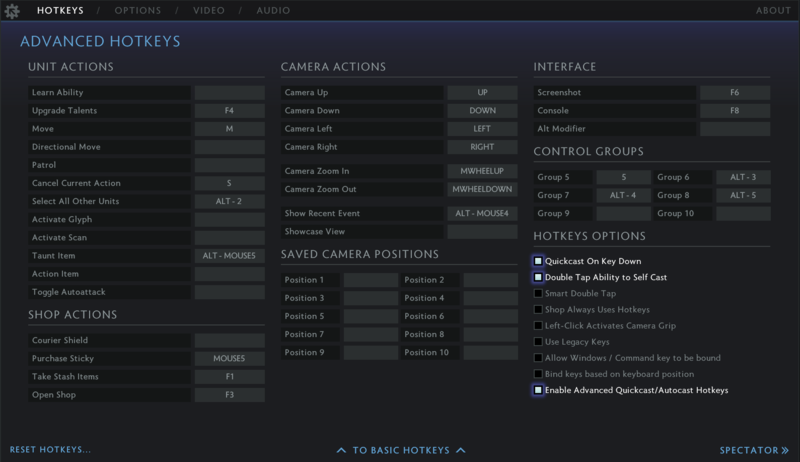 In this blog, I’ll share my settings with you and some notes regarding my Dota 2 config. Alt+Q, Alt+W, Alt+E, Alt+D, Alt+F and Alt+R for regular cast. I think quickcast is superior to regular cast in almost every way since as the name goes it’s just simply quicker. However, having regular cast is very useful in some situations (targeting when heroes are stacked, casting aoe abilities you aren’t comfortable with etc.) so I like to have an option for both. Same story for quickcast and regular cast here except that I have one dedicated hotkey for regular cast only for either tp or Forcestaff and one (`) for quickcast only since the game doesn’t allow alt+` to be bound (or at least it didn’t when I first set it up). I use that key mainly for boots so regular cast is pretty much never needed. Space, G, `, Z, X and last slot is empty for quickcast. Alt+Space, Alt+G, (Empty), Alt+Z, Alt+X and Alt+C for regular cast. I’ll skip the default ones here (Stop, Atttack etc). 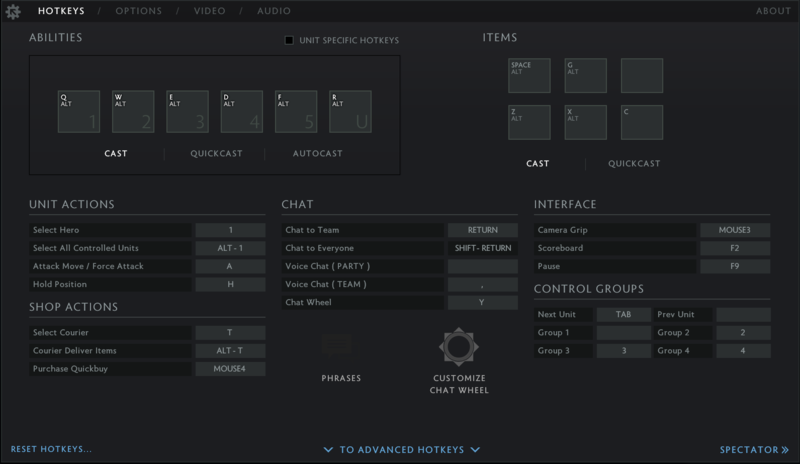 Not much to be said about hotkey options, only ones I have enabled are “Quickcast On Key Down“, “Double Tap Ability to Self Cast” and “Enable Advanced Quickcast/Autocast Hotkeys” which are pretty self-explanatory. Smart Double Tap is a useful option but for me it’s useless since I’m already using Alt for most hotkeys. Standard. 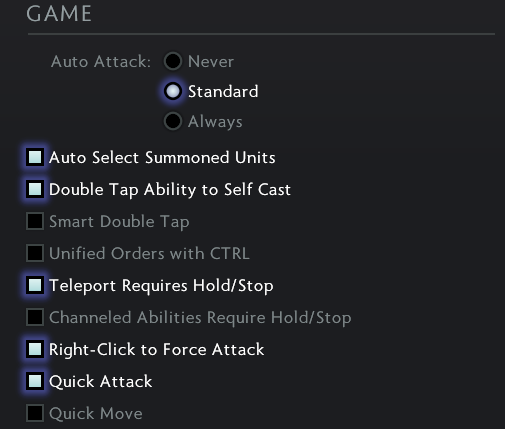 Think this is the optimal setting unless you are playing heroes that turning after casting abilities (due to autoattacking) is an issue for them such as Tinker and Earth Spirit (can’t think of any other hero I’d turn autoattack off completely for). With this your hero doesn’t autoattack but will attack after you’ve cast a spell or killed a unit with an attack. Wasn’t this already in the other page? Please, Valve.. This one is one of the best options in my opinion. It basically lets you shift-queue your action while tping without actually shift queuing (which would mean you cannot cancel the action without canceling the tp). Huge quality of life increase. I use this. Makes denying in lane much easier. There are downsides though, for example following an allied hero becomes a mission to find the M button (suppose you could bind it to an easier key to reach but that’s such an iconic key to move..) and missclicking on an allied ward in a fight or in lane fucks up with your movement. Basically same as quickcast, just makes things slightly faster/easier and reduces strain on the hand. This mainly comes to preference. 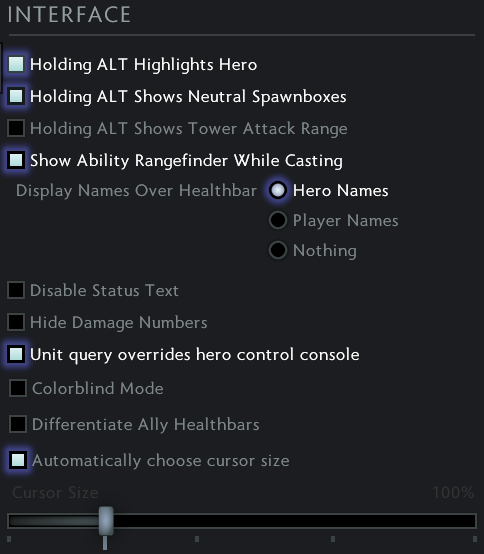 Only options I’m using here are Extra Large Minimap and Use Alt to show Hero icons which are once again pretty self-explanatory. 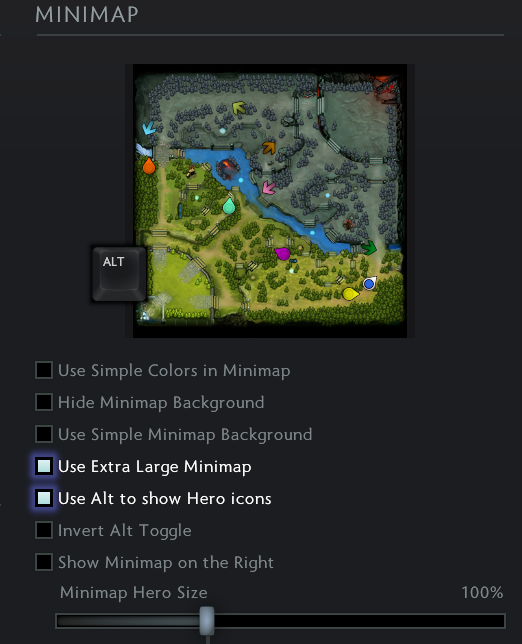 I wouldn’t suggest using the Invert Alt Toggle option, while it does make glancing at the minimap more informative in terms of hero positioning without having to memorize colors at the beginning of the game it means you can’t see the direction heroes are facing which is very important information. You can tell most of what’s happening in a teamfight just by seeing where the arrows are turning. It also tends to cover up lanes so you can’t see the creeps. I’ll just put a picture here. This is 100% down to preference so not much to talk about. I like to use Hero Names instead of Player Names since I sometimes have issues properly communicating heroes names in the heat of the moment (ever had a guy yelling “focus.. that guy kill that moron~!” in a teamfight?). 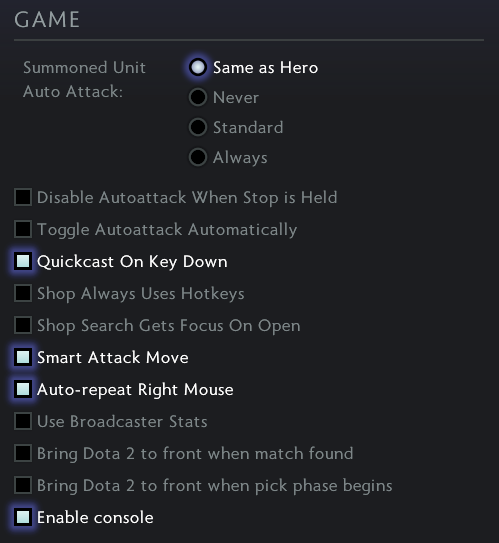 I don’t use either, these are new options and I don’t have any issues my current autoattack settings so I never considered trying them. Could be useful. I’m pretty sure I already enabled it in the hotkeys page.. Valve, please. That’s also a really great option. What it does is basically there is a little circle around your cursor and when you press Attack your hero will attack the unit closest to that cursor (instead of the unit closest to your hero when you press attack on the ground). It makes taking agro in lane much easier and you don’t get to see the ugly circle every time you click when you use quickcast. This has to be the most helpful option. I honestly could not believe having to play without it now. Just give it a try if you aren’t using it, there are literally no downsides and it makes playing so much easier since you don’t have to constantly spam mouse clicks. The stuff I haven’t mentioned are options I don’t use and I don’t think are useful/harmful so I don’t see a point mentioning them. One last thing is an option in Misc: “Dynamically Scale Hero Icons in Minimap“, this one makes your minimap even more clean so you can get a lot more info out of it during messy teamfights. I use the middle mouse button to move camera so I don’t really use any of the settings here. When I used to edge pan I had speed on max but that depends a lot on your sensitivity so nothing noteworthy here.